After announcing the update, Microsoft pulled it from its website. I found a link on Howard Forums which points to a download of the .cab file. I installed the file last night. It is huge at 6.1MB so I placed it on my Storage Card. The installation created a Windows directory on my Storage Card. I am wondering if the installation would have just overwritten the previous Office Mobile files in Storage Memory. After the installation I got into a continual reboot situation which necessitated the removal of the omap850_sdhc.dll (per my post), very bizarre. I may try reinstalling in Storage Memory. After I got passed the reboot problem, I synced some Office 2007 files and successfully opened them. Here is a link to an Outlook 2003, Outlook 2007, and Outlook for Web Access 2007 comparison chart of some key features. I can't say enough good things about Oultook 2007, it contains many new helpful features you can read about on this blog. Thanks to Jason Langridge for the link. One of the great features of using Microsoft Outlook and Exchange Server (I use 4smartphone's Hosted Exchange Service) together is the simplicity with which you can share calendars, tasks, contacts, or just about any mailbox folder. 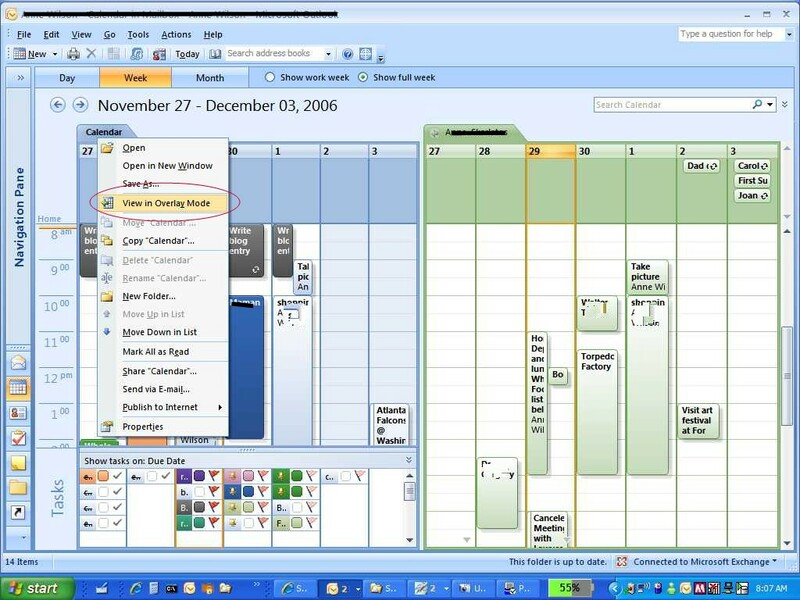 In Outlook 2003 there were two ways to view calendars together, side by side or in group calendar mode which displays a list similar to the scheduling view when you create an appointment. The side by side calendar view. 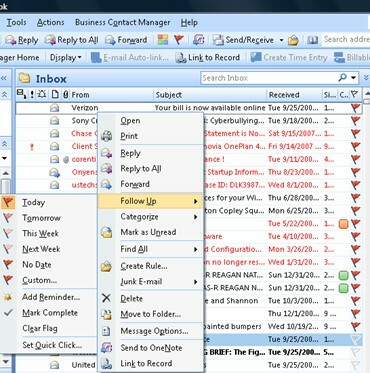 I just found another view in Outlook 2007, the overlay view. 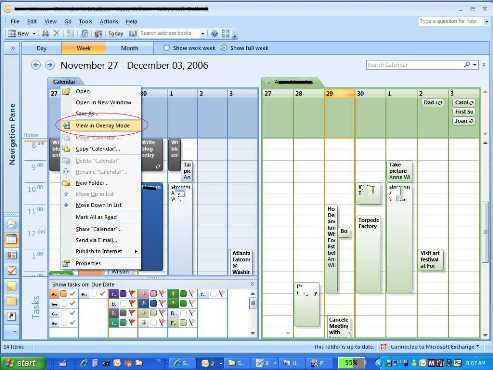 This view is selected by right clicking on the calendar tab and selecting View in Overlay Mode. The overlay view combines the entries of two calendars into one with the primary calendar displayed as solid blocks and the shared calendar displayed as transparent blocks. By clicking on the calendar tab, you swap which calendar items are displayed solid and transparent. 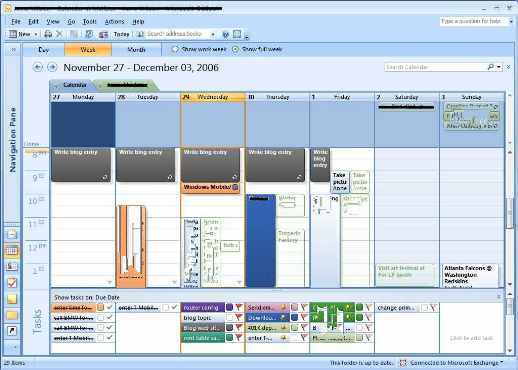 This is a another very nice feature of Outlook 2007 in addition to being able to view your tasks at the bottom of the calendar view. Microsoft is offering a free copy of Office 2007 Professional and Windows Vista Business just by viewing 3 webcasts or vlabs for each product set. This is a great offer, you can find out more information at http://www.powertogether.com/. Office 2007 RTM was made available yesterday on the MSDN download site. I downloaded it and installed without any problems. If you are using Outlook with Business Contact Manager, you should backup your database. If you are using Small Business Accounting 2006 and Business Contact Manager (BCM), disconnect BCM from the accounting system. You must remove every Office 2007 beta application and add in before installing the RTM software. After installation, if you want the fast search capability you will be pointed to download the new version of Windows Desktop Search (WDS). If you were using WDS with the beta, the new installation will wipe out the index, forcing a re-index. Office 2007 Pro is described to come with Outlook with Business Contact Manager, however I could not find Business Contact Manager (BCM). I am still looking for the RTM version of BCM. I installed the XPS / PDF add in found here. Outlook 2007 RTM used my previous profile information from the Beta2TR version so I did not have set up my personal options again. Having to re-index my system. Not being able to find the Business Contact Manager 2007 RTM application. I will keep this entry updated on my experience.